Congress President Rahul Gandhi on Wednesday filed his nomination from Amethi for the Lok Sabha Elections 2019. 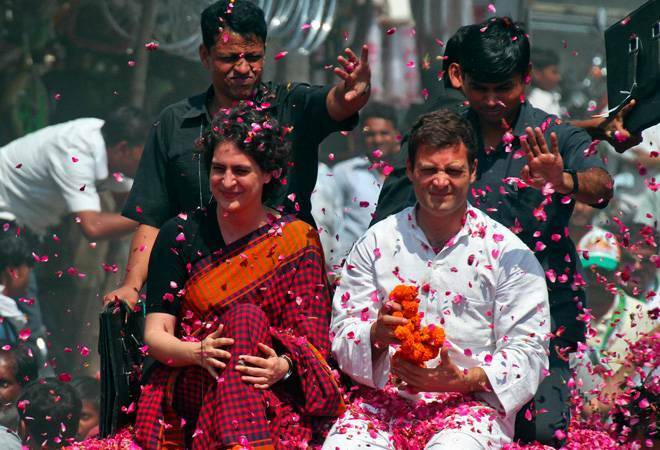 The Congress President was flanked by his sister Priyanka Gandhi, her husband Robert Vadra and Congress Chairperson Sonia Gandhi. During Rahul’s roadshow, the Congress supporters were seen shouting slogans like ‘Abki baar, 5 lakh par’, apparently setting the five lakh votes target for the Congress president. Rahul Gandhi is also fighting elections from Wayanad constituency in Kerala. Besides, Prime Minister Narendra Modi during his rally in Junagarh, Gujarat, on Wednesday attacked the Congress party, saying it snatched away “food from poor children” and filled the stomach of its own leaders. The country will witness the first phase of polling for a total of 91 Lok Sabha seats spread over 20 states and UTs on Thursday (April 11). Campaigning for the first phase of Lok Sabha elections 2019 came to an end on Tuesday, as political parties, including the BJP and Congress, making their ditch effort to woo voters. Catch all the latest updates on BusinessToday.In live blog on the 2019 Lok Sabha elections. 3.17pm: “Some relationships are of the heart. The whole family was there for bhai’s nomination. This was my father’s Karmabhoomi. For us, it is a Pavitra Bhoomi,” says Priyanka Gandhi. 2.38pm: The Election Commission of India (ECI) has stalled the release of a biopic on Prime Minister Narendra Modi, saying any biopic material sub serving the purpose of any political entity or individual should not be displayed in electronic media, including cinematography. 2.20pm: “The government and PM hid crucial facts and evidence from the Supreme Court. They hid that the price of the jets was increased from Rs 526 crore to Rs 1,600 crore, and refused to tell the price to the SC on the so called ground of breach of national securit,” says Congress leader Randeep Singh Surjewala. 2.15pm: Smriti Irani to file nomination from Amethi on Wednesday. 2.02pm: “Pak has officially allied with Modi,” says the Congress. Pak has officially allied with Modi! à¤®à¥‹à¤¦à¥€à¤œà¥€, à¤ªà¤¹à¤²à¥‡ à¤¨à¤µà¤¾à¤œà¤¼ à¤¶à¤°à¥€à¤«à¤¼ à¤¸à¥‡ à¤ªà¥à¤¯à¤¾à¤° à¤”à¤° à¤…à¤¬ à¤ˆà¤®à¤°à¤¾à¤¨ à¤–à¤¾à¤¨ à¤†à¤ªà¤•à¤¾ à¤šà¤¹à¥‡à¤¤à¤¾ à¤¯à¤¾à¤°! 1.50pm: The skeletons in the Rafale scam are tumbling out one by one, says the Congress. But sooner or later the truth comes out. The skeletons in #RafaleScam are tumbling out one by one. And now there is â€˜no official secrets actâ€™ to hide behind. 1.10pm: Sonia Gandhi, Priyanka Gandhi Vadra and Robert Vadra also present. 12.42pm: The Election Commission tells the Supreme Court it is not against the issuance of Electoral Bonds for funding to political parties but it is against the anonymity of donors and wants transparency in the Electoral Bonds scheme. “We are not opposed to the Electoral Bonds as such, as it will legalise donations. But we are opposed to the anonymity. We are against anonymity and we want transparency,” advocate Rakesh Dwivedi appearing for EC tells SC during hearing of pleas against issuance of Electoral Bonds, reports ANI. 9.50am: Kajal Kinnar Nayak, a transgender candidate of BSP, filed her nomination for Korei assembly constituency in Odisha. She says, “I can’t believe how much love I got from the public despite being a transgender,” reported India Today. 9.15am: BJP chief Amit Shah to hold two rallies today. 9.07am: PM Modi to hold three rallies today. NYAY is such a powerful idea. Absolutely amazing resonance in the field. Even PM (Past Master) canâ€™t stop talking about it. 8.35am: Prime Minister Narendra Modi will also hold public meetings in Gujarat and Goa. 8.25am: Uttarakhand, which goes to polls on April 11, has 11 polling booths which voters can reach only after traversing a distance 15 to 20 km on foot, Chief Electoral Officer Saujanya said on Tuesday, reported. Tehri district has four such booths, followed by Pithoragarh (3), Chamoli (two), Rudraprayag (1) and Uttarkashi (1), she said. Government Primary School, Dumak in Chamoli district has the farthest located polling booth in the state, which is 20 km from the nearest road, the official said. 8.20am: A total of 452 candidates have filed nomination papers for 17 constituencies in Maharashtra which will go to the polls in the fourth phase of Lok Sabha elections on April 29, reports PTI. Tuesday was the last date of filing of papers. The constituencies going to the polls in the fourth and the final phase in the state are Nandurbar, Dhule, Dindori, Nashik, Palghar, Bhiwandi, Kalyan, Thane, Maval, Shirur, Shirdi and the six seats in Mumbai. 8.15am: The Election Commission is learnt to have directed the Chief Electoral Officer of Delhi to ensure that the contents of NaMo TV are pre-certified by the local media certification and monitoring committee, reports PTI. Such committees are formed at district and state levels during polls. They clear political campaign and advertisements. 8.03am: The Income Tax Department has written to the Chief Electoral Officer seeking legal action against Karnataka CM HD Kumaraswamy, Deputy Chief Minister G Parameshwara and a host of his cabinet colleagues for allegedly intimidating tax officers and obstructing them from discharging duties, PTI reported. 8.00am: Congress President Rahul Gandhi will file his nomination papers from the Amethi Lok Sabha seat. He will also hold a roadshow and address a gathering. 7.55am: All parliamentary constituencies in 10 states and UTs, including Andhra Pradesh, Arunachal Pradesh, Meghalaya, Mizoram, Nagaland, Sikkim, Andaman and Nicobar and Lakshadweep, Telangana and Uttarakhand, will go to polls in the first phase on Arpil 11. The counting of votes will take place on May 23.